1. Preview. Preview is a strategy to active students prior knowledge, to facilitate their prediction about what they will read, and to generate interest. Preview consist of two activities: (a) brainstorming and (b) making predictions. A teacher introduces previewing to students by asking them to thing about the previews they have seen at the movies. The teacher prompts students to tell what they learn from previews by asking question such as, “Do you learn who is going to be in the movie?” or “Do you learn in what historical period the movie will take place?”. Then the teacher asks them to skim information such as headings, pictures, and words that are bolded or underline to determine (a) what they know about the topic and (b) what they think they will learn by reading the text. · For students to learn as much about a passage as they can in a brief period of time. · To activate the students’ background knowledge about the topic. · To help students make prediction about what they will learn. · To motivate the students’ interest in the topic and to engage them in active reading from the onset. 2. Click and Clunk. Click and Clunk is strategy that teaches students to monitor their understanding during reading, and to use fix-up strategies what they realize their failure to understand text. The teacher describes a click as something that “students really get. Students know it just clicks.” After students understand, the teacher explains a clunk: “A clunk is like when students run into a brick wall. The students just really do not understand a word the author is using. That’s clunk.” Then, the teacher reads a short piece aloud and asks students to listen carefully for clunks. The teacher asks students to write down their clunks and then teaches fix-up strategies to figure out the clunks. The teacher can use “clunk cards” (see materials for detailed description) as reminders of fix-up strategies. · For students to monitor their readig comprehension. · To identify when they have breakdowns in understanding (“clunks”). § Reread the sentences without the word. Think about what would make sense. § Looking for a prefix or suffix in the word. 3. Get the gist. Get the gist is the strategy to help the students identify main ideas during reading. One way to identify the main idea is to answer following question: (a) “who or what is about?” and (b) “what is most important about the “who or what?” In addition, students are taught to limit their response to ten words or less, so that their gist conveys the most important idea(s), but not unnecessary details. Set the gist can be taught by focusing in one paragraph at a time. While students read the paragraph, the teacher asks them to identify the most important person, place or thing. Then the teacher asks students to tell what is most important about the person, place, or thing. Finally, the teacher teaches students to put it all together in a sentence containing ten words or less. · To teach the students to restate in their own words the most important point as a way of making sure they have understood what they have read. 4. Wrap up. Wrap up is a strategy that teaches students to generate questions and to review important ideas in the text they have read. Wrap up consist of two activities: (a) Generating question; asking question about the passage and (b) Reviewing; thinking about what was important that the students have learned from the day’s reading assignment. · The goals are to improve the students. Knowledge, understanding, and memory of what was read. · Students use question starters: who, what, when, why, and how (“the 5 W’s and an H”). · Other students try to answer the questions. · Students ask some question about information stated explicitly in the passage, but “in your head”. 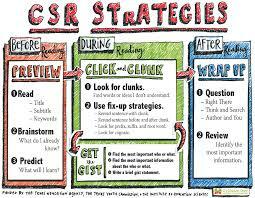 · To review, students write down the most important ideas they learned that they in their CSR learning logs. · They then take turn sharing their “best ideas”. Belum ada tanggapan untuk "COLLABORATIVE STRATEGY READING (CSR) IN READING COMPREHENSION"